My XL Mystery Box score. Very happy, especially with that original Freak shirt. 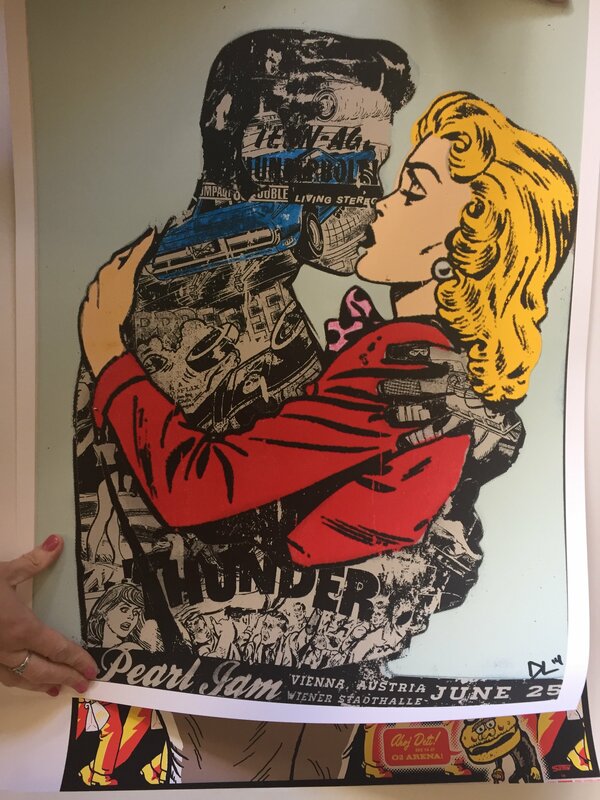 The 2 posters were Mancester & Prague 2012 both by Ames Bros. Wasn't charged any customs. Huzzah!!! Thanks 10club! Nice! Are you keeping the hat Demetrios? I am. 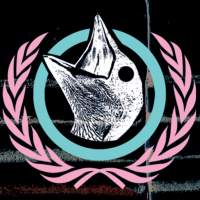 Did they ever make stickers of this design? Would love to put one on my constitution hard hat @ work. M XL box delivering today! 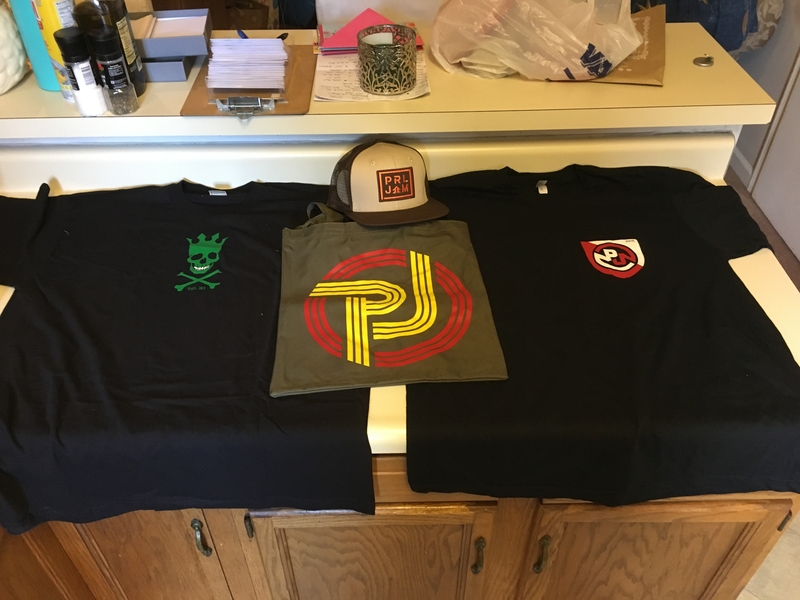 Looking forward to seeing what I get when I ordered at the bitter end of XL being available. 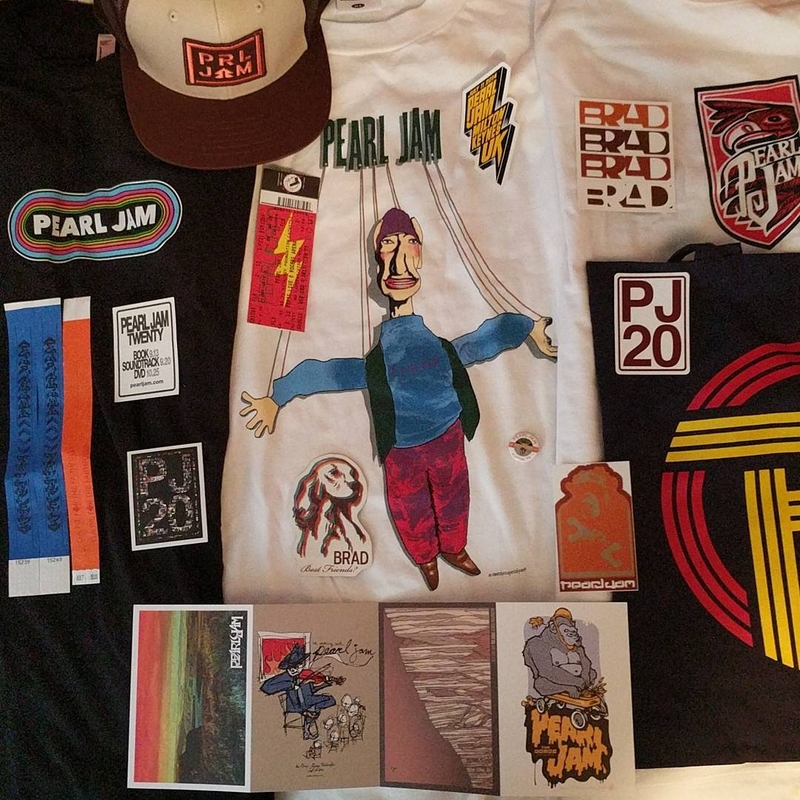 I pretty much only wear and hang stuff to shows I've been to (and that North Carolina t-shirt due to the cause). 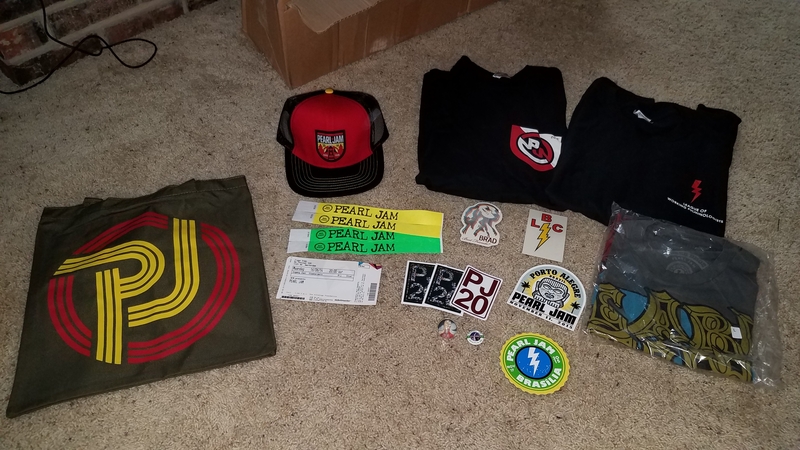 So I don't really know why I ordered a box... You get a job and suddenly the Pearl Jam expenses skyrockets. But anyways, is it easy getting "rid" of the stuff? Not looking to make a profit off it. But sell the contents to fans who need it more than me . I like those Gorge cards! Nice t-shirts too. 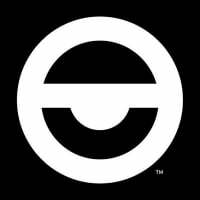 I get my wife's/daughter's mystery box tomorrow, I may shoot a video of them unpacking it in reverse - we do not have any repacking videos do we? My last 2 boxes are out for delivery now. 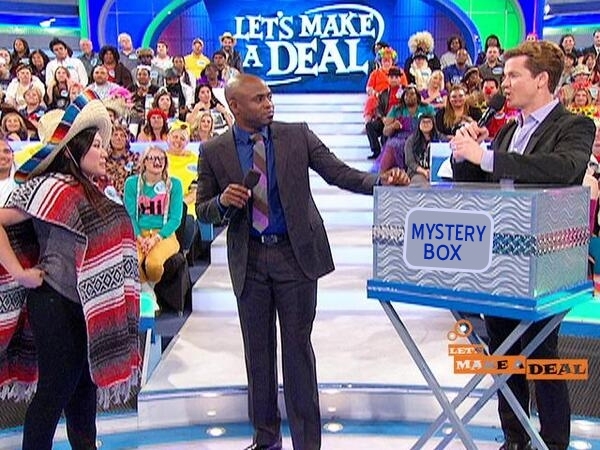 Both are men's large boxes. Might wait to open them on Wednesday when my wife is off work. That way we can try to video it. The one thing I was really hoping to get is one of them red stickman crash hoodie's. 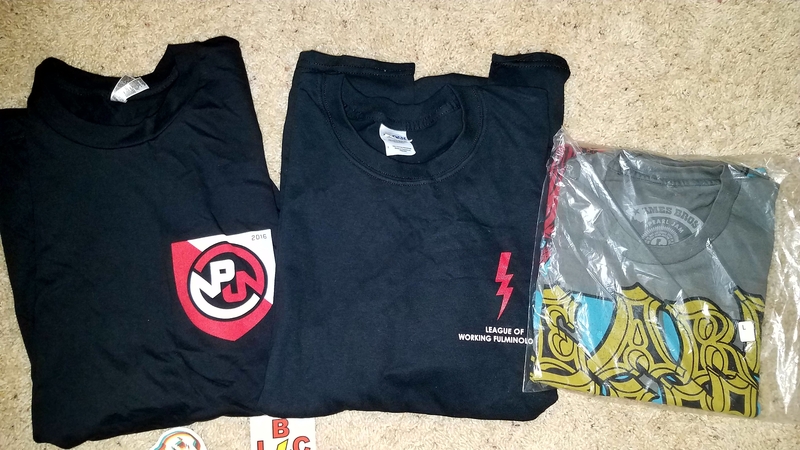 Assuming my last 2 boxes don't have one - I'll planning on putting together a nice package of items I'd be willing to trade for one - if someone has one in L or XL to trade. Received my 2 XL boxes today: All available for trade. Opened up my mens medium and I am very happy. 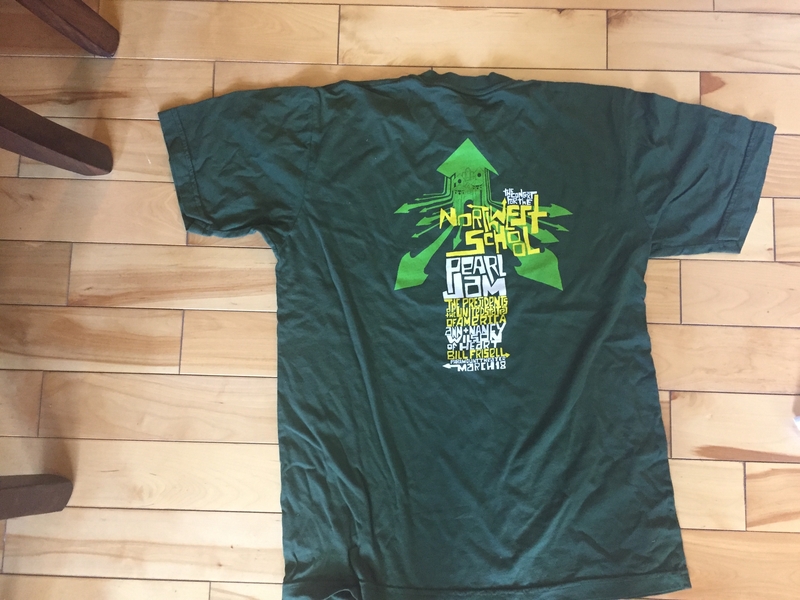 All different colour shirts and the green one is really cool. 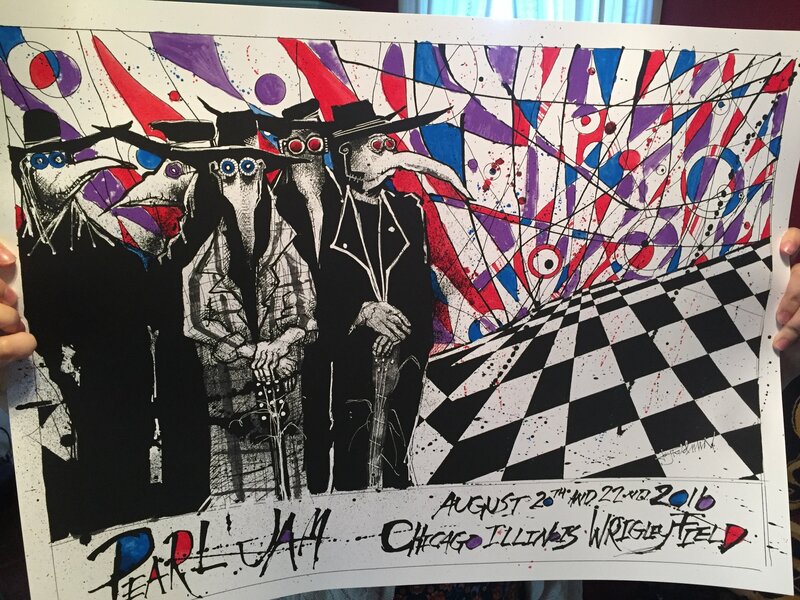 While I like all of it I did not go to the Euro tour and it is Euro heavy so you have have some trades in mind for the shirts or posters or are looking to buy let me know. If anyone is looking to trade hat for hat let me know as well as this one does not fit this noggin the best. My other poster is the Mcclowned. I was also shocked that my ticket stub was Worcester night 1 which was our first show. Nice surprise. 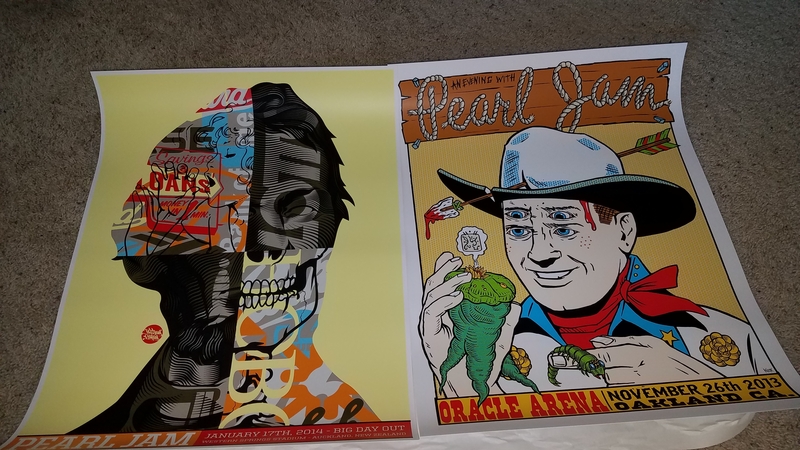 Posters are up for trade as well the Vienna poster is out of my wifes box. Is there a Pitt 13 inside or a Zonk? 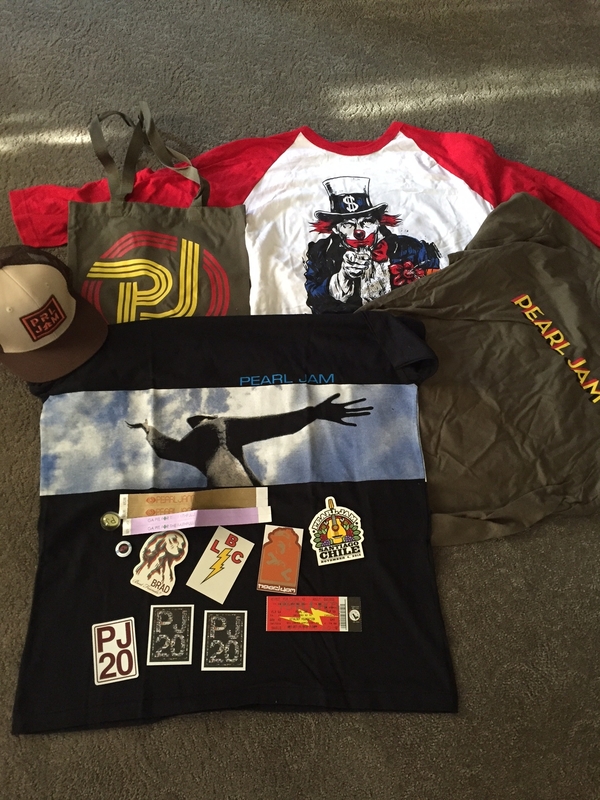 Here's my XL Mystery Box haul. Everything is for sale/trade. Not looking to get rich or anything. 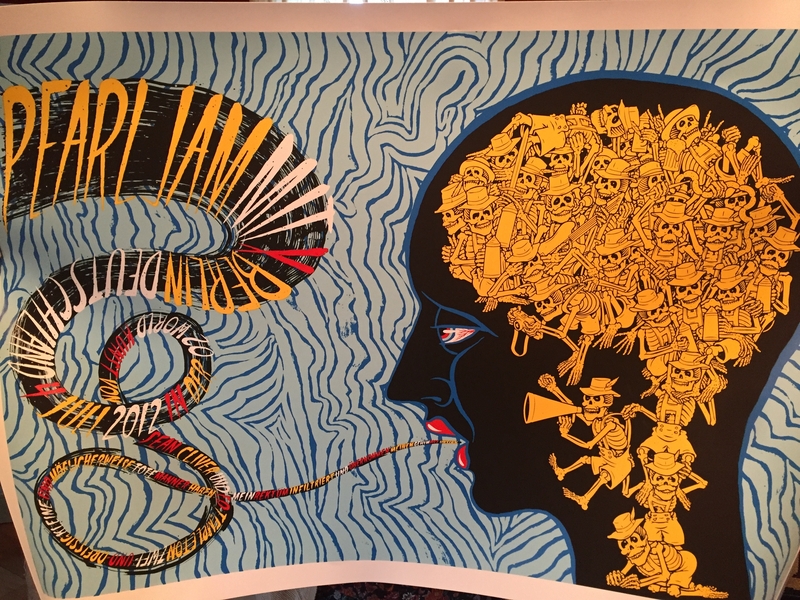 Like everyone, looking for the Pittsburgh 2013 poster, among others. Message me for info. I know this is a long shot and doesn't hurt to ask but does anyone want to trade a Calgary rodeo clown for a Czech Clown? I have two Mcclowns and would love the Calgary one. Hell I would throw both Czechs in if you were interested. Here is my Men's XL that came today. Pretty happy with the haul. 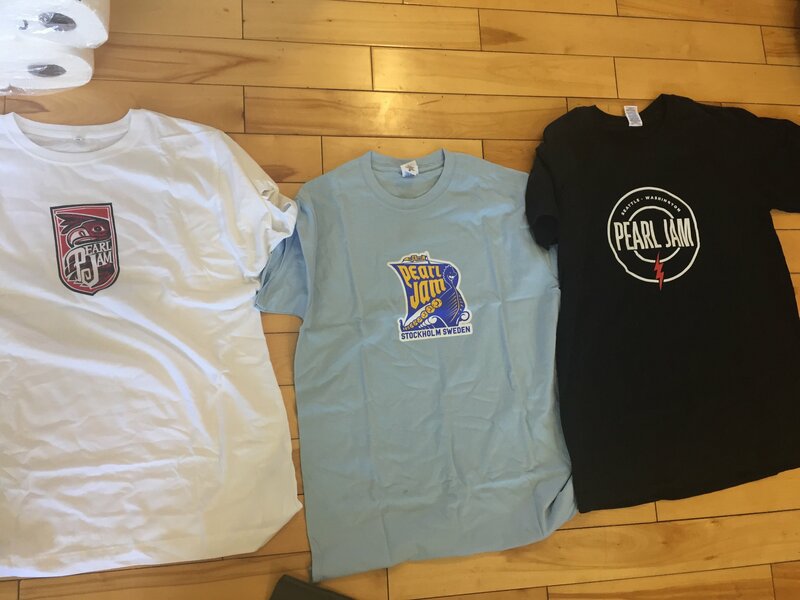 Any one know what tour the black shirt is from? Ticket is from Worcester 2013 and the pin is 11/07 Buenos Aires. 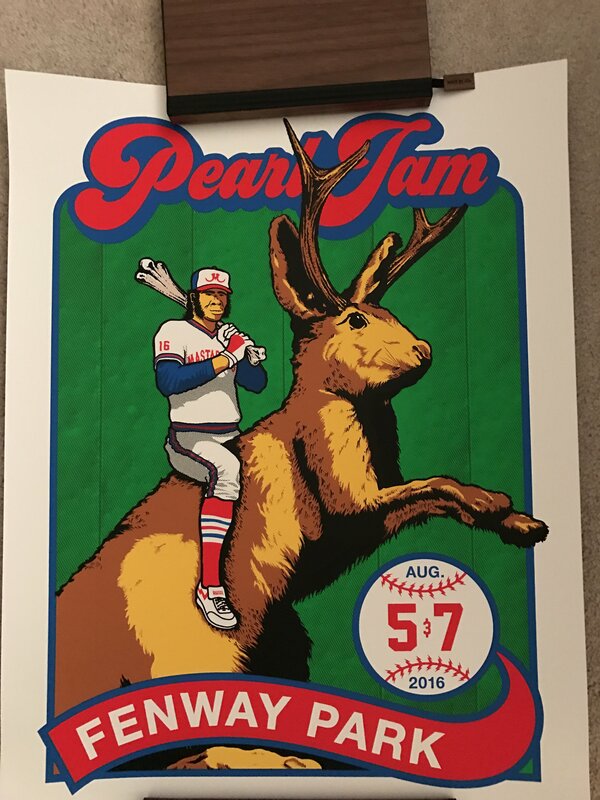 Posters are Global Citizen and Jackalope. Everything is up for trade or sale. Some of my box. 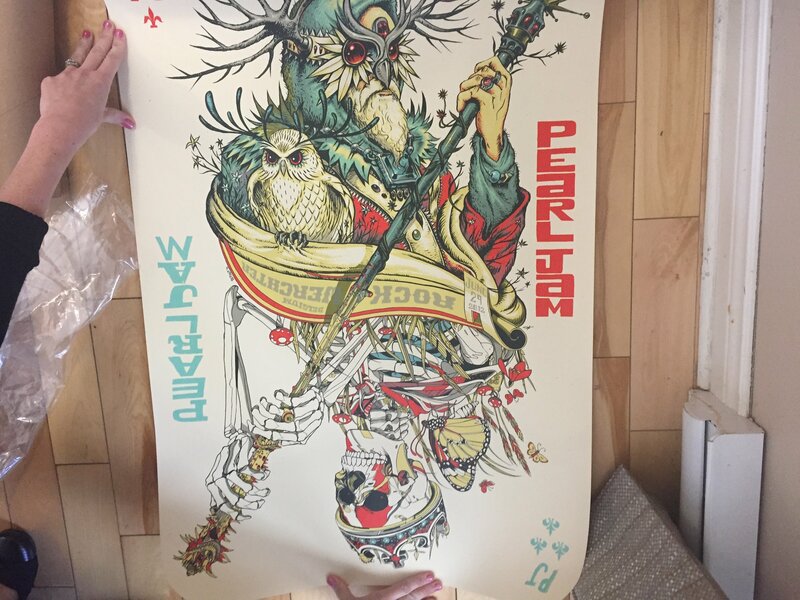 Not willing to trade posters but wanted to share. Very pleased with the posters and shirts. 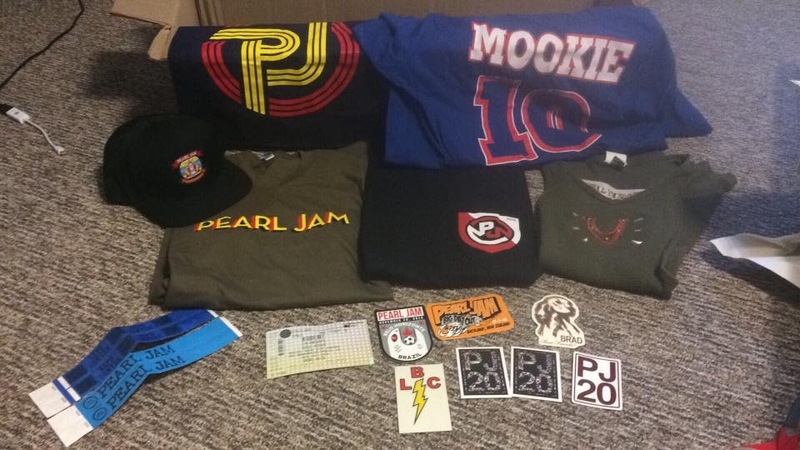 I will trade anything in the pic with the hat for a backspacer ball, different stickers, and a new ticket stub. I already have the NC 2013 stub and didn't enjoy that gig. PM if interested. Hat for a bouncy ball and some stickers? 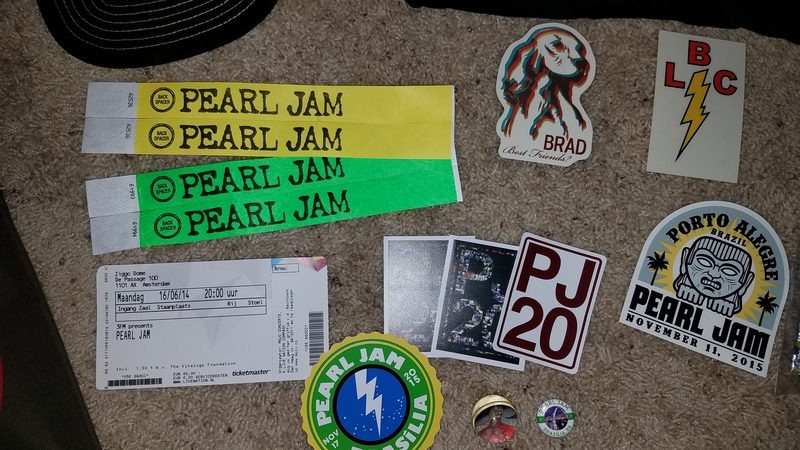 My score today from Large box #2!!! Dig the working "League of Working Fluminologists" 2013 shirt!!! Just about everything is for trade! 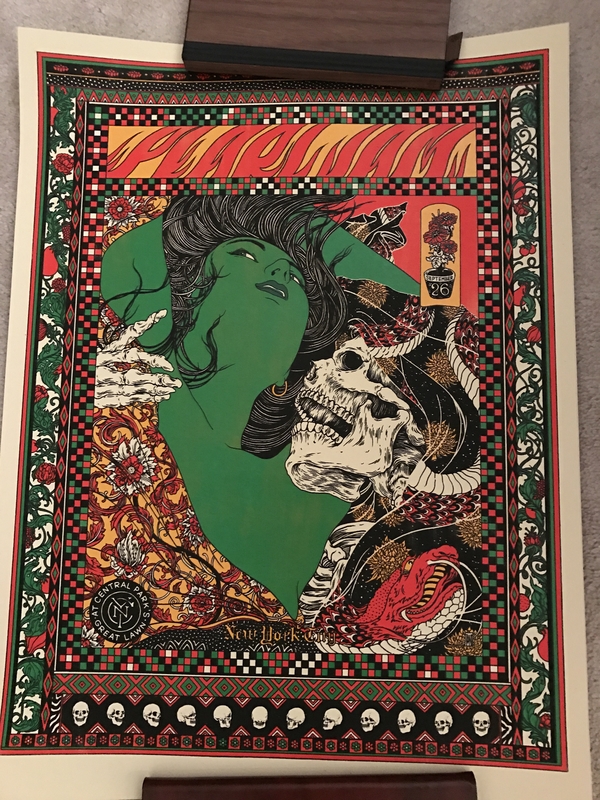 Posters are Amsterdam and NYC Broken Fingaz. 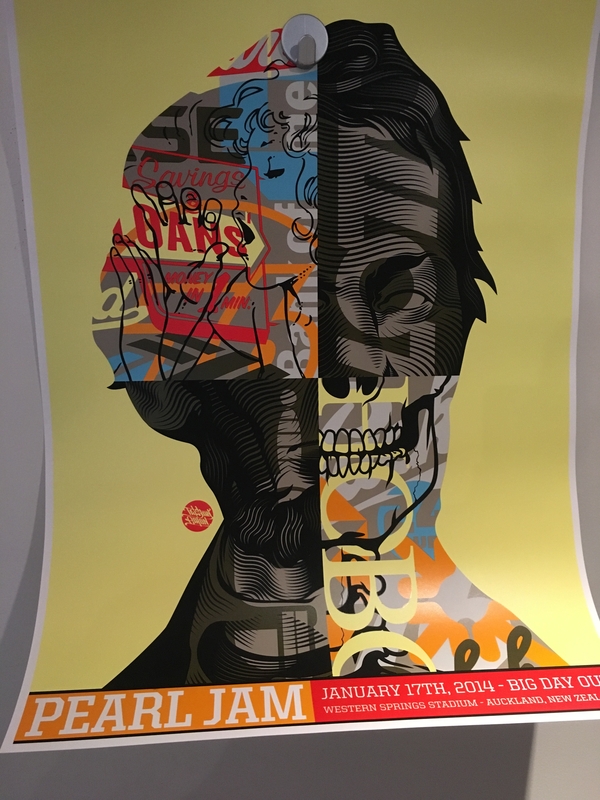 Would like to get rid of the NY, I got one at the show. 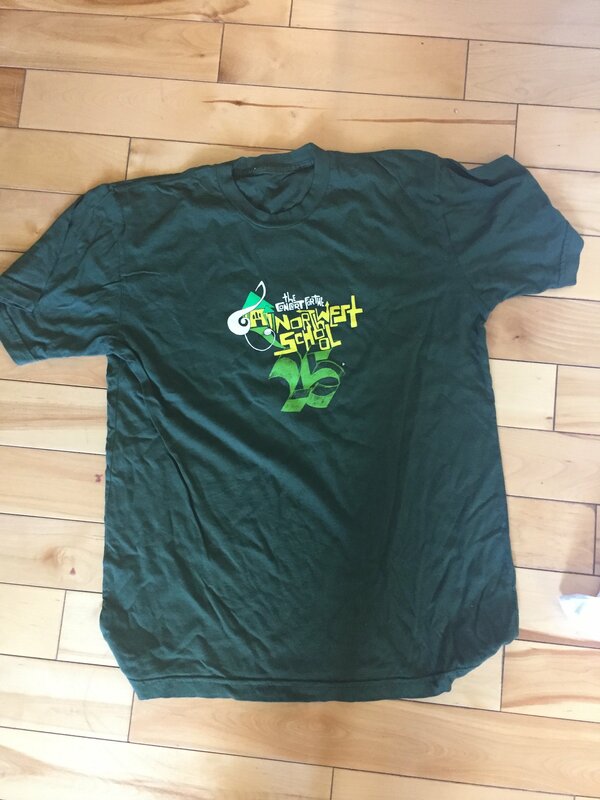 Anyone looking for this old tank top? .. Everything available except for the Mookie..
Men's Large box arrived today. Pin is Rio and yes, that is a Backspacer ball. Thanks 10C! 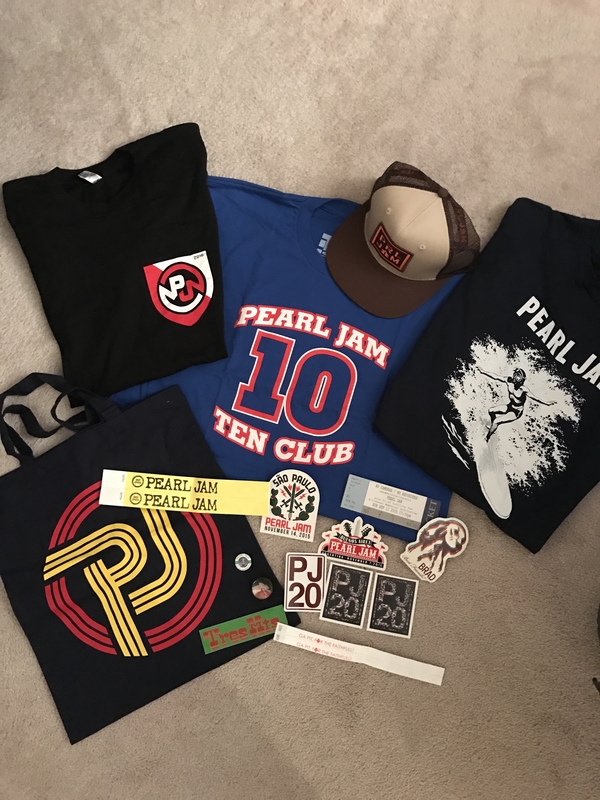 Are you up for trading/selling the hat or blue 10club shirt? Sorry - those are the two things I am keeping. Been looking for that shirt for awhile. Lol. I already have that hat. 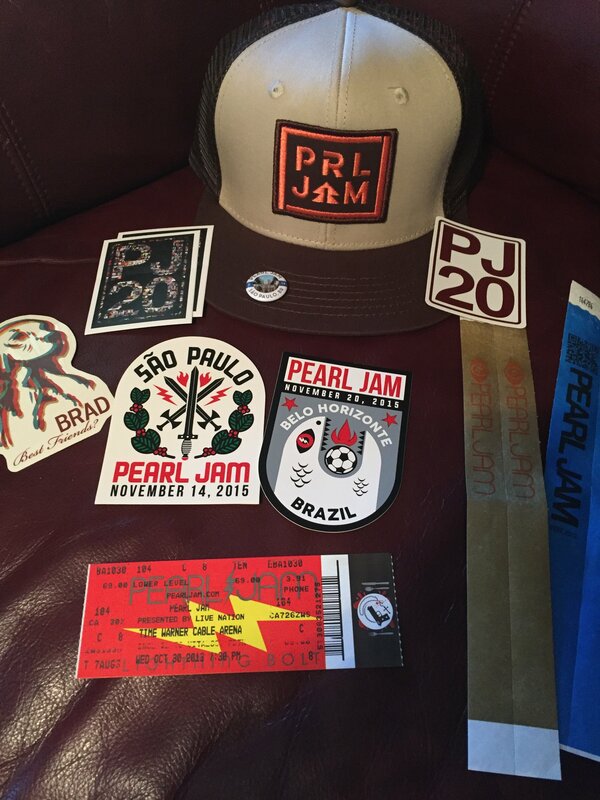 I'd trade the trucker hat for one of the more common posters like Jax 16 or Green Lady 16. 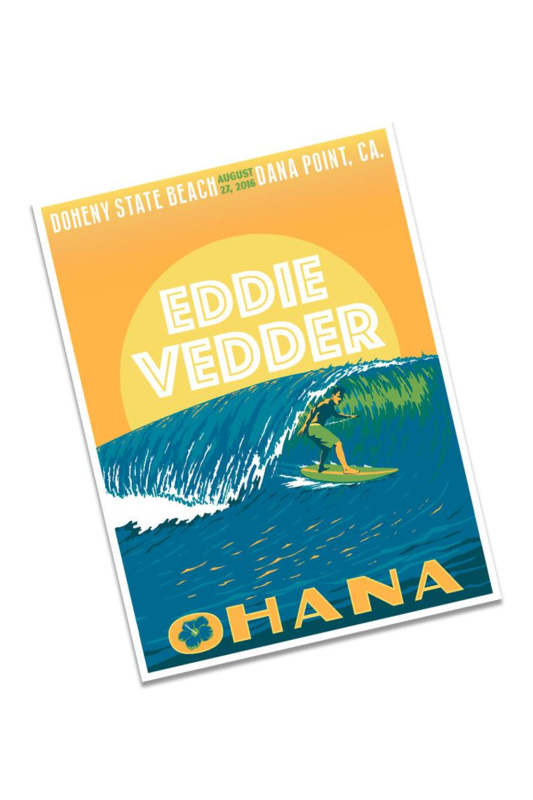 Would you trade for an Eddie poster? Send me a PM, quite possibly. 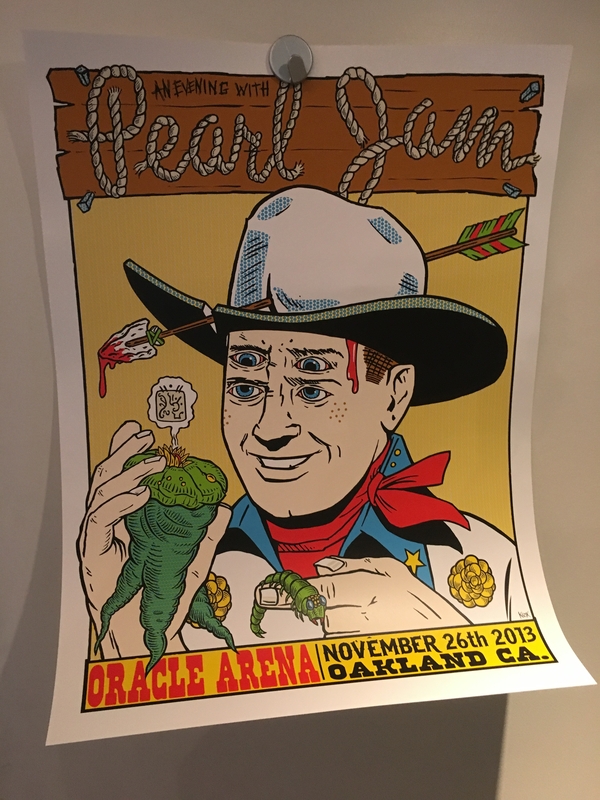 Any other posters? I truly have no need for that hat. Bought it in Columbia 16. I'll buy your Sweden-shirt. i found a hole in the one I bought at the show :( Or can maybe trade it for another shirt when my box arrives? I also picked medium. MB delivered in Ireland this morning and NO IMPORT charges even though $100 was declared.